rideTYRANT.com: Southwick, Windsor Locks, and Howard's! Yesterday was a pretty epic day. 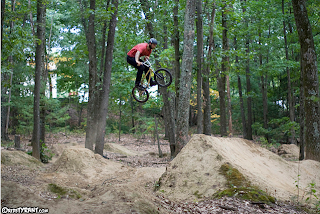 Steve and I rode the Southwick Trails for 3 hours, we hit up the new Windsor Locks park for a bit, we rode some nice banks with the Enfield Crew, and we hit up Ry Howard's house party till 1:30am. Gotta love Saturday's full of fun! The highlight of the day was a young kid and his WT mom at Southwick. The kid drops into the medium sized line like he knew what was up and attempted to roll the 3' first lip...which isn't rollable...it's a 4' gap! So the kid at sh1t hard, scorpion grind to the max! What's his mom do?...looks at me and says "his step daddy is a motocross champion...he wanna be like him" in the most WT Joe Dirt voice ever! I nearly peed my pants! You stay classy Southwick!